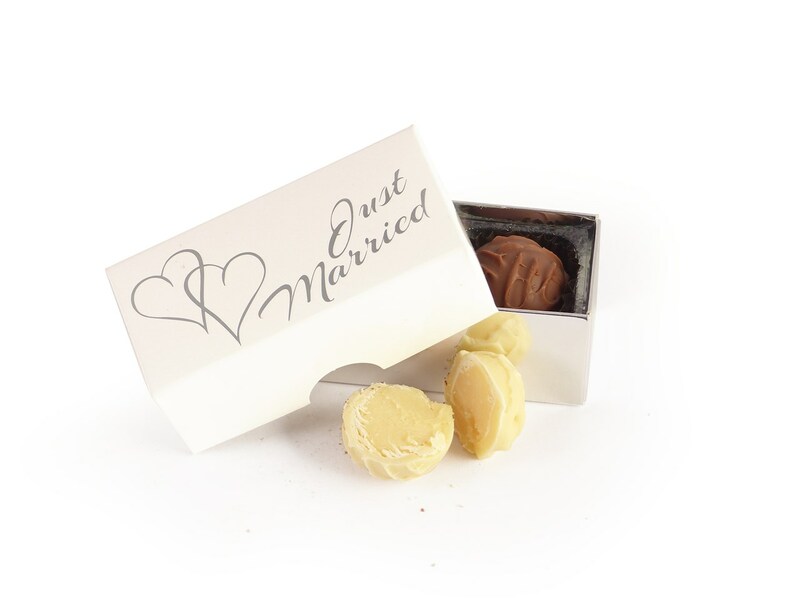 A delicious Wedding Favour Box filled with 2 Truffles in Milk and White chocolate lovingly made by Whitaker's, one of the UK's finest chocolate creating families for over 130 years. The box has a separate base in silver foil card and a lid in white gloss card printed in silver foil with entwined Hearts plus 'Just Married' text. The ingredients of the Truffles are fully listed on the base of the box. Please note the truffles in this box can be supplied with either chocolates containing alcohol or with a non-alcoholic filling, please select from the drop-down menu. This box is also available personalised with the happy couples names and date of the wedding, at an additional cost, please call us to discuss any of these options if required, please note there is a minimum order of 100 for personalisation. Box size: 85x40x34mm, Truffles 25g.